Michael Richens is back in the frame at Kettering Town. The midfielder made his return after a lengthy period on the sidelines due to suspension and family commitments as a substitute in the Poppies’ last match, which was the 2-0 defeat at Chesham United nearly three weeks ago. And Richens could soon be joined back in the Kettering squad by midfield sparring partner Ben Milnes. Milnes has been out of action since suffering ankle ligament damage in the 3-1 home success over Biggleswade Town at the end of January. 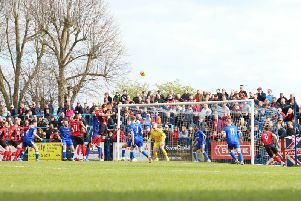 But boss Marcus Law confirmed that Milnes is now on target to return for the final month of the season, meaning the central midfield partnership which served the club so well during the impressive early weeks of the campaign could soon be reunited for the final push to secure a play-off place in the Evo-Stik South League Premier. “As far as Ben is concerned, he is probably going to be ready to play again in April,” Law said. “It’s good to have Michael back and we will need to get him up to speed as far as match action is concerned. The news isn’t so good for James Brighton, however, as Law confirmed the left-sided player will now miss the rest of the season due to a knee injury which has hampered him throughout the campaign. As part of the ‘Poppies in the Community’ initiative, Kettering Town are hosting a football course during the Easter holidays. The four-day course will run from Tuesday, April 10 to Friday, April 13 between 10am and 3pm on each day and it open to girls and boys of all abilities aged between five and 14 years old. The course is run by the club’s FA qualified coaches with emphasis on fun-based coaching and games. Each player receives a certificate of attendance and there will be awards for the player of the week for each age group. The cost of the course is £60 for all four days or £18 per day. For a booking form and more information, email to jason.thurland@ketteringtownfc.com. Booking forms can also be found online at: www.ketteringtownfc.com/youth. Former Poppies manager Lee Harper, meanwhile, is running two goalkeeper coaching camps in Northampton during the Easter holidays. Harper, who played in goal for Kettering and Northampton Town, will be staging the camps at Thomas Beckett School on April 4 and April 11.